So if you’re looking into how to get to the North Shore of Oahu by bus from Waikiki, you probably know that it will take some time to get between the two. And if you didn’t know… well, now you know! But is it really as bad as it’s made out to be to take the bus to the North Shore? It really just depends on entirely how you feel about it! As long as there are things you want to do on the North Shore and you know going into it that it’s a long journey, you can end up back in Waikiki in the evening thinking that you had a great day! 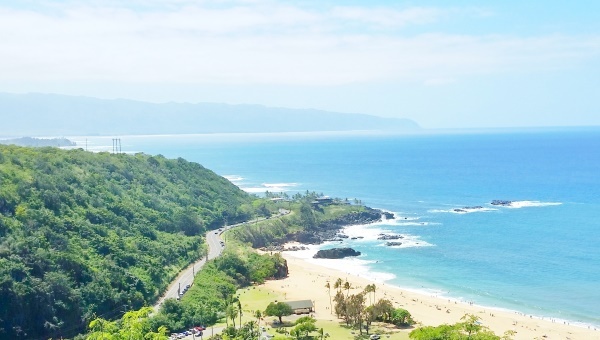 Because the good news is that since the Oahu bus services most of the island, at least the North Shore is one of the things you can do on Oahu by bus! And… here are the best things to do with ONE DAY on the North Shore! Just how long of a bus ride is it to the North Shore from Waikiki? You can expect your bus journey to take over 2 hours, and likely closer to 2.5 hours. It will also likely involve at least one bus transfer. But the actual time it takes also depends on where on the North Shore you’ll be going. Where on the North Shore do you want to go? What’s typically thought of as the North Shore of Oahu runs about 12 miles along the west coast from around Kuilima Cove and Turtle Bay Resort on the north end to the main town on the North Shore of Haleiwa on the southern end. When you’re taking the bus to the North Shore from Waikiki, having one specific area, maybe 2, that you want to go will be very helpful. In theory, you can decide to go snorkeling at Kuilima Cove on the very northern part of Oahu, and then a few hours later take the bus to go snorkeling at Shark’s Cove a little further south on the North Shore, and then a few hours later take another bus to go snorkeling at Waimea Bay even further along on the North Shore. But the thing is that the bus may only come around once an hour, which might mean longer wait times to make sure you don’t miss the bus. And then maybe even more wait time if the bus is delayed. But if you are committed to exploring different spots to snorkel on the North Shore by bus, you can definitely do this! Although, for snorkeling on the North Shore, the summer months provide the ideal snorkeling conditions. But if you might not want to spend so much time waiting for the bus when you’re trying to get between places on the North Shore, then you’ll want to choose one area, or maybe 2 areas so that you’ll require the bus within the North Shore just once or not at all. This can also allow you to better maximize your time to make it even more worth it to make the journey from the North Shore to Waikiki by bus! Take a look here for your directions from Waikiki to the North Shore! It might also be helpful to take a look at these tips for taking the bus on Oahu. But Google Maps public transit directions are amazing for planning your bus trips anywhere around Oahu. The one thing you’ll want to check for in the public transit directions is that the departure time is in the morning, or similar to a time you actually will be leaving. You will also want to make sure the day of the week matches the day you’ll be taking the bus to the North Shore. Here what’s most important so you can get the best idea of bus timings and transfers is that you at least match weekday vs Saturday vs Sunday, since those days can differ the most from each other. The specific date usually isn’t important. If you know exactly where you’ll be staying in Waikiki, plugging that into your starting point can help you get a better idea too.